Slay the Monsters. Defend the Castle. Become the Master Munchkin! 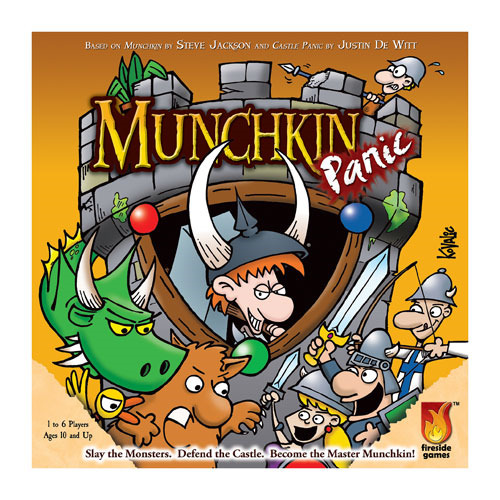 Munchkin Panic Board Game is a semi-cooperative tower-defense board game for 1 to 6 players that combines the all-for-one gameplay of Fireside Games' popular Castle Panic with the all-for-me gameplay of Steve Jackson Games' classic Munchkin. The Munchkin Monsters have found the Castle Panic Towers and are on the rampage! Players combine cards to hit and slay the Monsters before they destroy the Castle. Each defeated Monster becomes a Trophy that gives up its Treasure to the victor. If players work together to defeat the Monsters, the player with the highest point count becomes the Master Munchkin. But get too greedy and the Monsters will stomp the Castle flat! Ages 10 and up.